Voting for the Top 50 is now underway (see also Top 100 mods and games). Now another 10 days of voting begins as the Top 50 Apps battle it out to crown the 2015 winner. 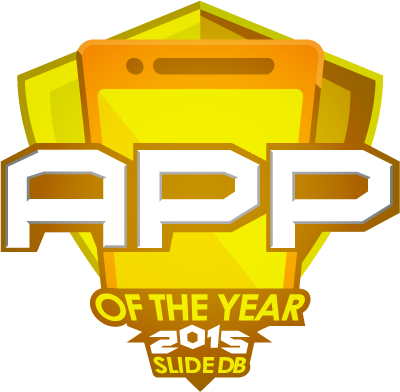 You have up until the 21st of December pick who will take away the 2015 App of the Year! Some of the top picks from this year's Top 50 are Cyclos: Revolution, Space Jump, Discouraged Workers, DeadRiot and DuneCraft RTS among many other great apps. Keep promoting your hard work by tweeting @SlideDB and posting to our facebook page. "You can vote for more than one App, so vote for all your favorites!" If you made it to the Top 50, don't miss this opportunity to spread the good word and get the support you need to take the winners crown, keep showcasing all your hard work and informing the community of your releases! Congratulations for the huge effort to apps that made the final count and for those that didn’t it was very close. Best of luck in top 50! Very cool! We're stoked to be in it. Thanks everyone!